SEO is a highly important sales channel for many business owners. Good news! 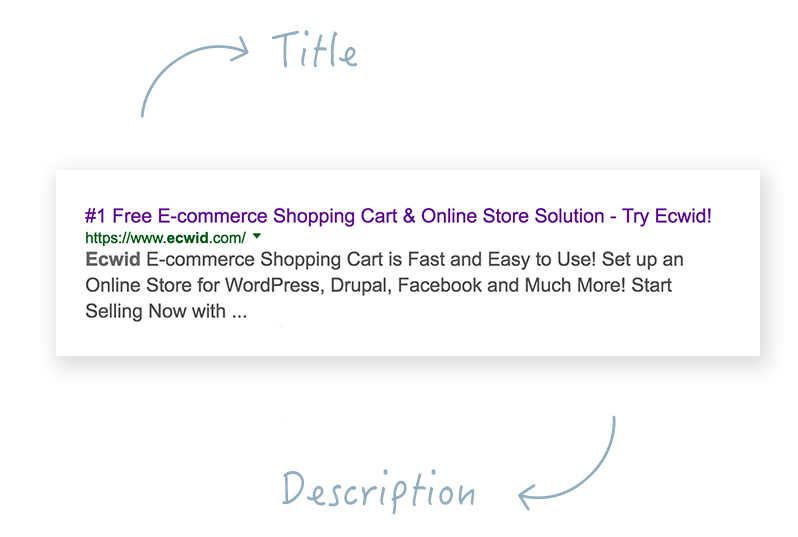 Now you can create custom SEO page titles and descriptions for products in your Ecwid store. This will help you to develop and fine tune your SEO strategy, improving your results in Google searches. Google uses a webpage’s title and description to get information about the page and its contents. These are called meta tags – snippets of text that describe a page’s content, contained within the code. They don’t appear on the page itself, but only in the page’s code. You must have seen tags (e.g. marketingtips) and hashtags (e.g. #ecommerce) used on blogs and social media to help people find information and discussion on the exact subject they’re interested in. Meta tags are more or less the same thing, but used by Google search, not by people: they are little content descriptors that help to tell search engines what a web page is about. Google and other search engines use the information contained in meta tags to rank pages and create more relevant search results. By default, Ecwid generates meta data (page title and meta description) automatically, based on the product names and descriptions you’ve entered in the Catalog. While this is a convenient feature, there are two reasons why it may not always be the best option. Search engines display a limited number of characters in the search results, so auto-generated values may be too long and Google will not show the full text. This is far from the most important information about this product. 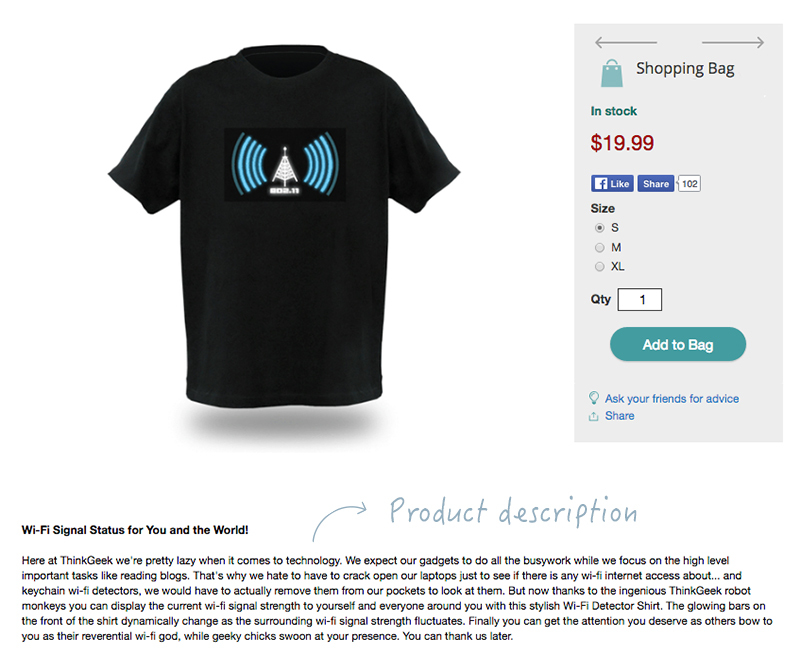 Merchants write product descriptions and names for customers, not Google. 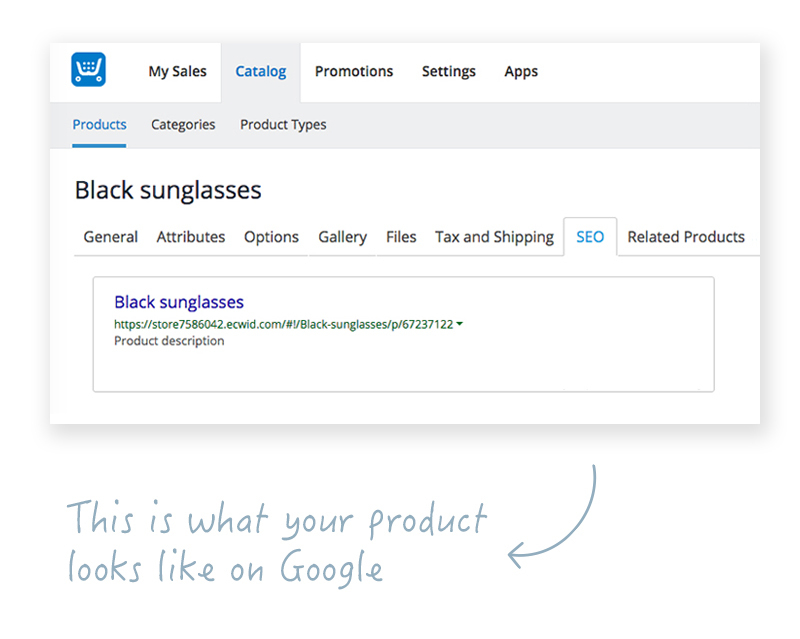 Your product description can be perfect for the customer, but bad for your search results. How can I make product descriptions compatible with SEO? You’re in luck — Ecwid has done it for you already! Now you can create meta tags manually for all products. Use your meta tags to include precise information about individual products and their details, like the product’s brand, size, or color. Brush up on keywords and use descriptive words to help guide customers to your products. The meta tags feature works for all Ecwid stores with paid subscriptions, except in the cases where your storefront is embedded using iframe and Wix. To set up meta tags for your own store and products, go to Product Details and select SEO. This feature is available for all paid Ecwid merchants. If you have more than a handful of products in your store, it can seem overwhelming to change them individually. Luckily, there’s a simple solution: batch editing. You can use a CSV file to change SEO tags for your products in bulk, updating your whole store inventory all at the same time. Developers and experienced users can also do this in API. Excited about the SEO update? Stay tuned — the Ecwid team is always working on developing more cool features. While you wait, take a dive into our articles about using SEO effectively to boost your e-commerce online store. SEO could be your next step to success. Prepare yourself with 5 SEO tactics you need for your store, and learn how to create awesome product descriptions that are also SEO-friendly and start advertising your store.